One of our missions at The Crafty Cask is to help educate and inform…but in a casual, fun way. Meaning no highly technical speak, but instead like we’re talking to a friend. Since many of our “How It’s Made” articles have the spirit distillation process in common this article is where you can learn all about it. So whether we’re talking about vodka or bourbon or gin…this core process is consistent across them all. Don’t get me wrong, there are HUGE differences either as part of this process or outside of this process when making different spirits. And that’s where our specific “How Its Made” articles come into play. If you’re reading the How Vodka Is Made article you can count on the fact that this core process is a part of the process, but all of the vodka-specific differences are outlined in detail there to layer on further spirit-specific understanding. So essentially…if you’re interested in learning about spirits distillation this is a great starting point. Then continue on through the spirit specific articles to continue your journey. Ready to learn the basics of distillation? Let’s go! All Craft Spirits are Farm to Glass, Right? Not so fast there young spirits Jedi. 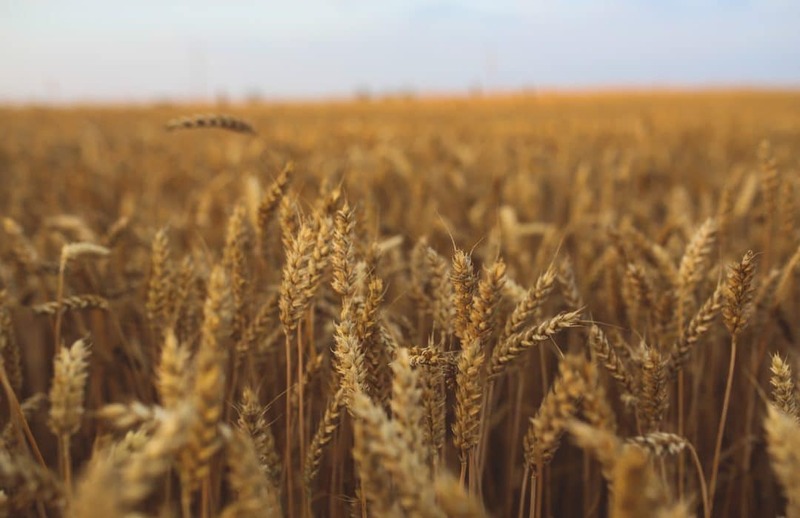 While the whole essence and idea of craft alcohol production might lead you to believe that they’re all starting from the purest raw materials (grains, grapes, potatoes, corn) directly that’s not really the case. You see, craft producers can choose to stat with raw materials or they can choose to start with pre-made neutral spirit that they purchase. Why would they do the latter? Honestly it can be quite a bit cheaper and easier…especially for small producers just starting out. You need less equipment, less space, less time and less expertise in the up-front stages of mashing and fermentation. It can also provide an easier path to consistency since you’re requiring your neutral spirit producer to deliver a consistent product to you. There is a third even more intense option than simply starting with raw materials though. While rare, there are some craft producers out there who are actually “seed to glass.” Meaning that they actually choose and cultivate the seeds to grow their unique mix of grains that are then turned into the base of their spirit. More to come here with a new producer in Illinois we’re pretty excited about who’s doing this, stay tuned! To Mash or Not To Mash? Let’s assume we’re talking distillation that starts with the raw materials for our purposes. So, if you are making spirits from grains or potatoes, you heat the ingredients in hot water to produce a mash and then add enzymes that break down the starches into fermentable sugars. Grape- or fruit-based spirits already contain sugars needed for fermentation so they get to skip the mash step. Why is sugar so important, you ask? This leads us to the next step to producing spirits: fermentation. 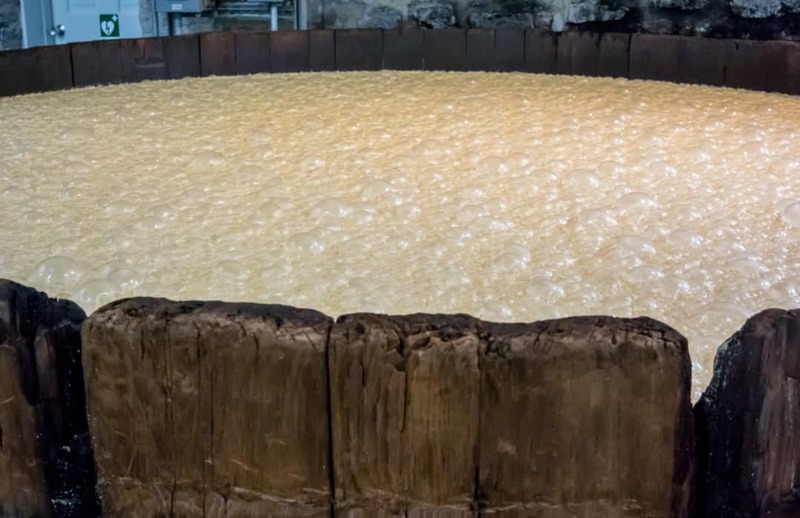 All spirits distillers start the fermentation process by adding yeast. Yeast are living microorganisms that eat sugar. Distillers can use wild or airborne yeast, but most use brewer’s yeast or create their own cultured yeast strains to create distinct flavors and aromas. Although we are starting to see a rise in craft producers using wild yeasts (naturally occurring in the environment where they are doing the fermentation) which is pretty exciting since it lends a unique taste of place element to the process. Distillers ferment in large heated tanks. If using a mash, distillers strain the liquid into the tanks. Some use starter tanks where the initial fermentation process begins before the mixture moves into a larger fermentation tank. Fermentation is when the yeast chow down on the sugar. The byproducts of their gluttonous feast are carbon dioxide gas (CO2) and ethyl alcohol. Some believe the yeast are burping or farting, but that’s not true, even though it’s a great visual of the process and enough to make anyone giggle. The yeast is simply giving off gas almost like a person sweating. Fermentation tanks have a valve that allow CO2 to escape, leaving distillers with alcohol. When the yeast eat all the sugar the fermentation process is over. Fermentation lasts anywhere from a few days up to a few weeks. Distillers take the liquid, or “wash,” and transfer it into a new tank where distillation occurs. 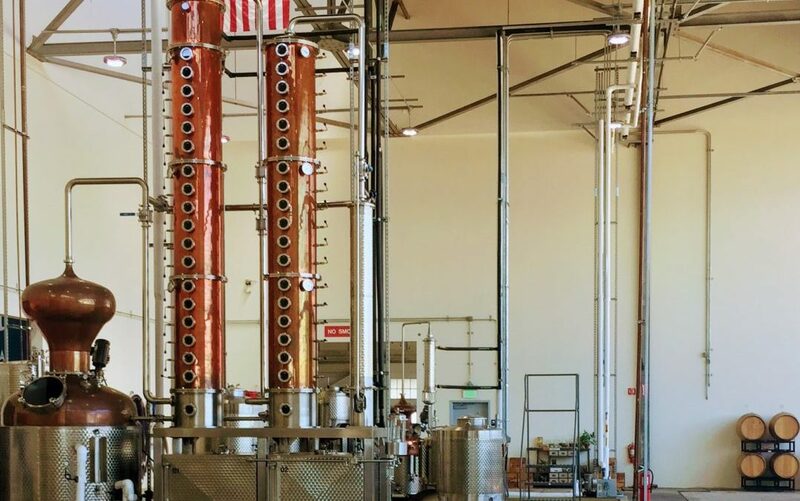 These tanks, or “stills,” are shaped like a pot or column (like those pictured in the first image here) and have both a heating and cooling source to turn the wash into a neutral spirit. Wait, what? Quick chemistry refresher: as liquid reaches its boiling point (100 Degrees Celsius), it turns into steam. When the steam cools, it condenses and turns back into liquid. So why are we taking a liquid, turning it to vapor just to turn it back into liquid? 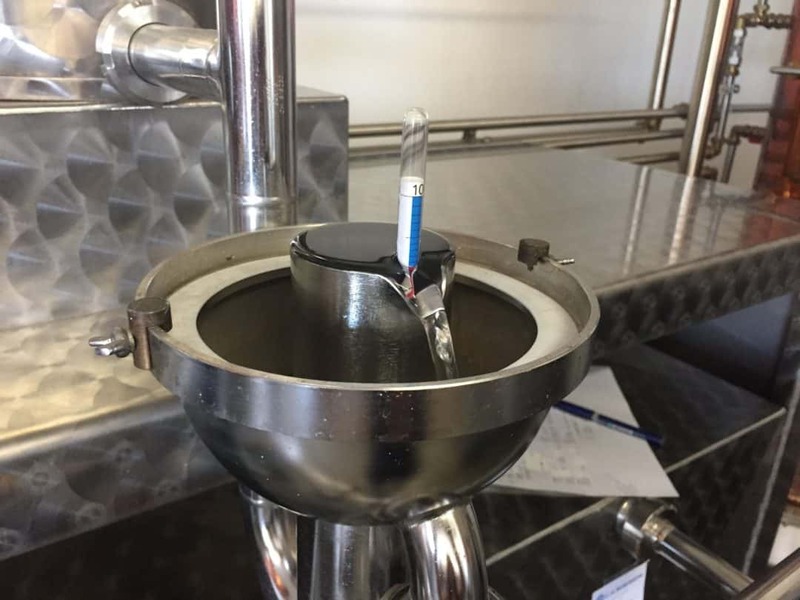 To remove water and condense it down, therefore increasing the ABV (alcohol by volume). So after this first stripping distillation run – where the primary purpose is simply to strip out water and concentrate the alcohol we move into the spirit run. This is where the art of the distiller comes in. The purpose of the spirits run is to separate the Foreshots, Heads, Hearts and Tails to create your final spirit for bottling. The what now? I know…this starts to get fun! These are pretty lethal and the first vapors to boil off here, typically making up ~5% or less of the volume. They are almost entirely methanol alcohol (you know…the stuff that can make you blind? No bueno.) and other volatile alcohols. So you don’t want any of this in your final product and distillers just discard the foreshots entirely. (side note here – while we all complain about it still being illegal to home-distill, this one stage shows how important it is to really know what you’re doing. Pretty serious consequences here if you mess up as you’re learning whereas that’s not quite the case with beer or wine). These come off the still next and continue to be pretty intense…like that rubbing alcohol kind of smell and taste (although please don’t taste rubbing alcohol to see what I mean!). While the heads are technically drinkable you really don’t want much or any of this in your final product. Legend has it that a high quantity of heads in a spirit is what causes those nasty hangovers. You’ve likely had these types of spirits before so can kind of get a sense of what I’m talking about. If it smells and tastes volatile it likely is! Now we’re getting to the good stuff…the smell and taste of this mellows out considerably from the heads. 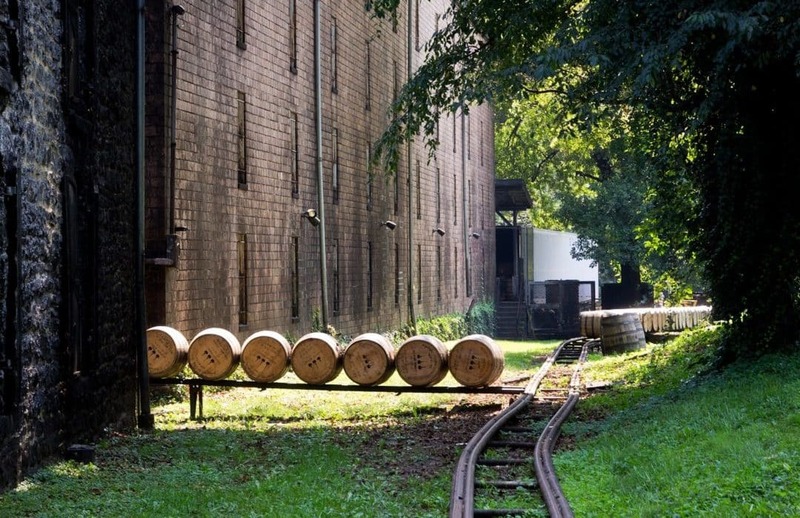 While distillers can often tell where the transition points between these different phases are by temperature this is also where the art of craft distilling and the expertise of the distiller tasting the spirit coming off the still comes into play. So the distiller has to start tasting to determine when to start collecting what’s coming off the still…ideally when it’s almost all hearts. Or maybe just a bit of heads still mixed in depending on their goal from a flavor and cost perspective. They also have to taste to figure out when to stop collecting the hearts so that they don’t get too much of the next phase into their final spirit. Now we get to our last phase, where most of the lower boiling point alcohols have already evaporated off leaving behind only higher boiling point, less desirable alcohols and lots of water (along with some carbohydrates/proteins). Read, not very tasty and not really what you want to be drinking. So just like distillers have to show expertise in determining when the heads end, they also have to be able to determine where the tails begin so they’re only collecting what they really want in their final product for all of you. The tails typically make up 15-30% of the volume in the spirit run. Once the neutral spirit, ideally mostly made up of the heart cut, cools to room temperature distillers check the alcohol content and purity. If the liquid has a low alcohol content, distillers repeat the distillation process to raise the alcohol concentration…i.e. taking more water out through the process previously described. If the liquid has too high of an alcohol content distillers can also add water to dilute the spirit and achieve a lower desired alcohol percentage. To remove flavors or aromas, distillers use filters until the spirit obtains the desired flavor (or flavorless) profile. This is where there is some debate, particularly in the craft world. Many distillers dispute that if you’re starting with quality ingredients and following a good process you shouldn’t have to filter it at all…because that would just take the flavor out that you worked so hard to create! I bet you can guess which side of the filter fence we’re on…why filter if you’re starting with quality ingredients and following a quality process?! Yay, time to taste! Unless the spirit your creating requires aging. Whether it’s barrel or bottle aging, that would be the final step to create your finished product. Since aging tends to be spirit specific we talk quite a bit about those processes in the spirit specific “How It’s Made” articles. But this is another area where the art of the distiller comes in to play since they have to make many critical decisions about the aging process. Namely; how to age, what material to age the spirit in, what temperature to store the aging vessels at, how often to agitate the liquid (if at all), and how long to ultimately let it age before bottling/selling. There are, of course, also some legal requirements on aging depending on what you want to be able to put on your label as well. But that is for another time!